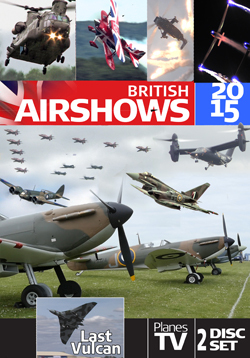 The “British Airshows” production is something of annual treat for airshow enthusiast. It is a round-up from many of the UK’s major air displays all crammed into a two hour feature. 2015 was a historic year for airshows, but as the introduction says, not entirely for positive reasons with the Shoreham tragedy dominating the news wires. However, Planes TV’s production concentrates on the positive recording many highlights of what is a very popular form of entertainment throughout the summer for thousands of people. 19 different events feature over the two hours. These are Abingdon, the Huxford VE-Day Anniversary Airshow, Throckmorton, RAF Cosford, Wellesbourne, Cleethorpes Armed Forces Day, Manchester, RNAS Yeovilton, the Royal International Air Tattoo, Eastbourne, Dawlish, Bournemouth, Shoreham, Dunsfold, the Scottish Airshow, Coventry Vulcan Members Day, the Battle of Britain Anniversary Airshow at Duxford, the Yorkshire Airshow and the Vulcan to the Sky Club Day at Gaydon. A late addition at the end of the production is some footage from the Vulcan’s final flight at Doncaster Airport. With PlanesTV’s good relationship with the Vulcan to the Sky Trust, it is not surprising that many of the Vulcan’s various appearances during the season are well covered. The Battle of Britain Commemorations too from a number of different events are also well covered, but you cannot help but think that PlanesTV missed out by not being at Biggin Hill for either the Festival of Flight or Biggin75 or indeed the mass fly-out at Goodwood. Other notable absentees include Flying Legends, RNAS Culdrose Air Day and the Sunderland International Airshow. For some of the big shows where there are a lot of different highlights and unique moments, the action can come across as very “quick-fire” with some fleeting glimpses. However full credit must to the editors for fitting so many memorable moments in. The inclusion of coverage from Shoreham Airshow may be controversial to some. However as mentioned in the narrations, PlanesTV felt it important to mark some of the displays before the Hunter accident. There is some sombre coverage of the high and quiet flypasts by the Sea Vixen and Vulcan during the aftermath of the accident. To their credit there is plenty of warning and the beauty of DVDs and Blu-Rays is that you can easily skip the chapter. As always, British Airshow is a two-disc edition with the second disc containing the best of PlanesTV’s trademark “Interactive In-Cockpit” videos. These include footage from Meteor T7, Bristol Fighter, Nieuport 17, RAF Falcons, Norwegian P-51D Mustang, Pitts S-2S Special, Patrulla Aguila, The Blades, Jet Provost, AeroSparx, the Calidus Autogyro, Spartan Executive and the Aerostars. These are often fascinating to watch, though the “Angle” and “Audio” buttons are beginning to disappear from modern disc players with the function hidden away in various on-screen sub-menus. The very few editing issues aside, this is still a great round-up of the season that doesn’t shy away from the more difficult moments.